A lip brush with a gorgeous handle fully lacquered in the style of Ishikawa Prefecture's traditional craft Yamanaka lacquerware. The firm and smooth touch, unique to weasel hair, will allow you to paint your lips perfectly in one go. 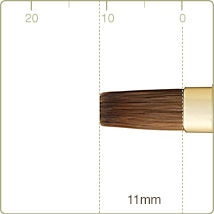 You can enjoy vivid colors with the slightly wide brush head.